We all know spring really means spring clean. This year, why not make yours a green spring clean -- free of all those nasty chemicals? Here are five top tips to help from our friends at AspenClean, makers of our 100% Ecocert certified natural household cleaners. Microfiber cloths are better at picking up dust, dirt, hairs, lint and microbes than cloth or paper. To freshen up carpets, try sprinkling them with a little baking soda, leaving overnight and vacuuming in the morning. A soft pumice stone is a great tool for scrubbing away mineral deposits and stains on marble. Instead of focusing on killing germs, focus on getting rid of the carriers. Microfiber cloths and mop-covers are far more effective at picking up dust, dirt, hairs, lint and microbes than cloth or paper. Add a few drops of tee tree oil to your cleaning solutions to add cleaning power. To remove kids crayon marks from walls try applying some baking soda paste and let it dry before brushing it off. Here's one more general rule to keep in mind to help reduce your workload: always be sure to clean from the top down and the inside out. 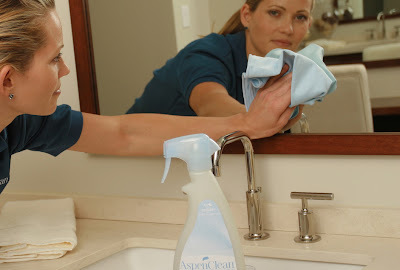 Enter for a chance to WIN an AspenClean Whole House Cleaning Kit (value $50) packed with four natural cleaning sprays and four matching microfiber cloths in our Go Green Get Clean Spring Giveaway. The post enhance my thoughts and experience. So nice!